The HyperGainÂ® HG5827G High-Performance Reflector Grid Wi-Fi Antenna is ideal for long-range highly directional 5.8GHz ISM and UNII band applications. 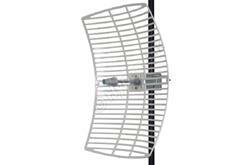 These antennas are ideal for point to point systems, point to multi-point and wireless bridges. Its compact design makes it nearly invisible in most installations, and it can be installed for either vertical or horizontal polarization. Rugged and Weatherproof - The antennas' construction features a rust-proof die cast aluminum reflector grid for superior strength and light weight. The 2-piece reflector grid is simple to assemble and significantly reduces shipping costs. The grid surface is UV powder coated for durability and aesthetics. The open-frame grid design minimizes wind loading. 2 in. (50.8 mm) diameter mast max.